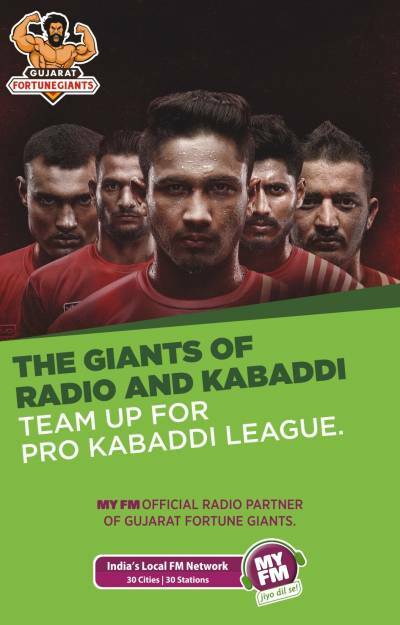 MY FM, the radio arm of Dainik Bhaskar group, has partnered with Gujarat Fortune Giants for the ongoing Pro Kabaddi League 2018. The radio network has become the official radio partner of the Gujarat Fortune Giants. As part of the partnership, the radio station will be hosting a series of on air activities across various platforms that will include on-ground activities and on-air initiatives. For this association, MY FM has planned an on-air festival of Kabaddi with programming to help bring Kabaddi champions closer to the listeners. On daily basis, the GFG team anthem and specially compiled Piyush Mishra poem will be played. The network will have bytes of team player aired across all the three stations. Special segments like Kamaal Hai Kabaddi and Gaano Ki Raid will be promoting the day's matches. Fans can win official team merchandise by participating in Khel Kabaddi Ka, an RJ led contest. In a unique promotional initiative, MYFM is organizing visits to 16 societies by its RJs; in six of these societies, the network is conducting two matches - Fathers Vs Fathers & Mothers Vs Mothers. With an aim to reach out to fans and educate masses on the sport, it is also organizing Kabaddi ki class, a fun and entertainment session on Kabaddi tricks & learnings.